Throughout his short NBA career, Minnesota Timberwolves point guard Zach LaVine has been known for one thing: his high-flying dunks. Ever since his days at UCLA, all people could talk about was his athleticism and high-flying acrobatics. However, its only for so long you can hold that moniker until people wonder if that is all you can do? This season, LaVine has answered that question in a huge way as he is developing into a polished scoring threat for the Timberwolves, giving them another scoring option outside of Andrew Wiggins and Karl Anthony-Towns. Thus far, LaVine has upped his statistics across the board from last season. He is averaging 21.4 points, 3.2 rebounds, and 3.1 assists in 37.9 minutes per game. Along with his scoring going up, LaVine is shooting a career-best 47.7 percent from the field and shooting a respectable 39.8 percent from three-point range. On Friday night against the Sacramento Kings, LaVine showed off his scoring prowess as he torched them for a career-high 40 points and shot 7-of-12 from the three-point range. Even though the Timberwolves lost 109-105, it was impressive to see LaVine knock down three-pointers consistently with his quick release. On numerous occasions against the Kings, LaVine showed that he was able to come off the pick down and knock down the three-pointer, along with knocking it down off the dribble. The three-point shot has been LaVine’s best friend, since he entered the NBA. In his rookie season, LaVine shot 34.1 percent from distance, but improved in his second season, shooting 38.9 percent from downtown. If LaVine can knock down the three-point shot at a 38 percent clip or better, he will be just that more dangerous as a combo guard on the Timberwolves. He essentially provides what Ricky Rubio cannot and that is offense. Rubio is a pass first, score second point guard, which works in Minnesota’s offense, especially when you have guys like LaVine, Towns, and Wiggins. However, LaVine gives Minnesota that spark and excitement, not only by just shooting three-pointers but also being efficient with his two-point field goals and getting to the free throw line. This season on two-point field goals, LaVine is shooting 53.7 percent, which is a far cry from last season, where he only shot 48.2 percent. 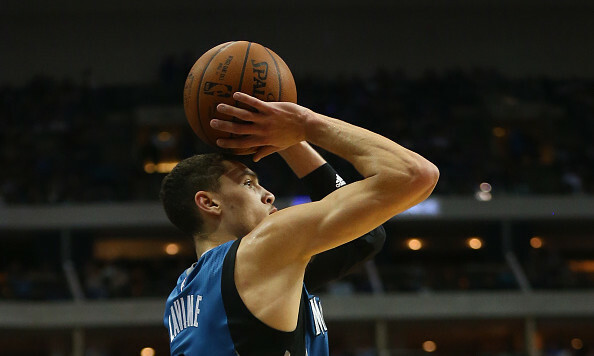 Then when it comes to the charity strike, LaVine has gotten to the line 91 times and is shooting 87.8 percent. Last season, he got to the line a total of 203 times, but that should change this season as he has started in every game thus far. It is fun to see LaVine take this next step in his NBA career as for the Timberwolves to be successful this season and down the road, they need a legitimate third scoring option. We’ve already seen this season how dangerous Minnesota is when they have Towns, Wiggins, and LaVine clicking on all cylinders. It makes life tougher for opposing teams because they cannot just focus on one specific player or double team Towns in the paint because you have guys in LaVine and Wiggins, who are lurking on the perimeter. If LaVine can continue to further along his offensive game, then there is no reason why he cannot be one of the top-10 scoring threats in the NBA very soon.